Buying a pool is a large investment in your home and can be a difficult decision. With all the options available to you, making an informed choice can tiresome. With each type of pool, you have your advantages and disadvantages but it all comes down to what you really desire. An above ground pool offers a few large advantages over in-ground pools. The most important of all starts with the money involved. Above ground pools cost one tenth of the price that an in-ground pool costs. In-ground pools can raise those already high property taxes because they are considered a permanent structure. 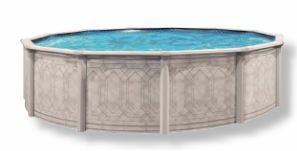 The cost of maintaining an above ground pool is much less and is more flexible than one that is built into the ground. Above ground pools are smaller and thus you have more space in your backyard for other things like a patio or a play area for children. They are generally easier to clean and maintain due to their size. In-ground pools require daily maintenance for obvious reasons. Every time you cut the grass or the wind is especially strong, your in-ground pool will be covered in plant matter and dirt. This requires extra tools to clean and maintain as well as your valuable time. Another disadvantage to owning an in-ground pool is the critter problem. More often than not you will find yourself rushing to save critters that fall in and can’t get out, and sometimes fishing them out when it’s too late. With an above ground pool, you don’t have to worry about grass or plant matter falling in for two reasons: The pool is too high to collect as much waste as an in-ground and you can easily slip a cover over your pool to protect it at night. You also won’t have to worry about critters getting trapped. When purchasing an above ground pool, people want one that is the right size, built of quality materials and is attractive. There are many different styles and materials that you can choose from to customize your pool to suit your specific desires. In-ground pools are thought to be much desirable but they can negatively impact the resale of your home. When selling your house, you can miss out on potential buyers because they are forced to take on the extra costs of running and maintaining an in-ground pool. Above ground pools are easy to install and can be removed whenever you feel it has run its course. In-ground pools are a major construction project. This means heavy machinery, your backyard being dug up, having to redo your landscaping, and dealing with worker crews until the construction is complete. You could spend an enormous amount of time just waiting to get your pool up and running. Last but not least, there is the issue of safety. With small children running around, it is hard to keep a permanent eye on them around the pool. In-ground pools are easily accessible for children and they always seem to want to explore the deep end. Above ground pools require an adult’s assistance to get into, so you can control when your child is swimming. You can also remove the ladder when it is not in use. Making the decision the purchase an above ground pool versus an in-ground pool can be a hard one, but once you see the benefits of above grounds, your decision might be that much easier to make. It certainly is an easier financial decision. Some parents want to be sure their kids are actually going to use the pool regularly. An above ground pool also makes a great starter pool when kids are young. Years later, if they prove to be dedicated swimmers, you can always switch to an in-ground pool, or even move your above-ground to a different location.